It’s no secret that social media can absolutely destroy your productivity. Sites like Facebook, Twitter, Google Plus, Pinterest and more have a tendency to siderail your time and effort. Hell, even YouTube can launch you into countless hours of watching silly cat videos. Do you ever wonder how much time you spend on social networking sites throughout your day? More specifically do you ever wonder just how long you’re browsing Facebook? 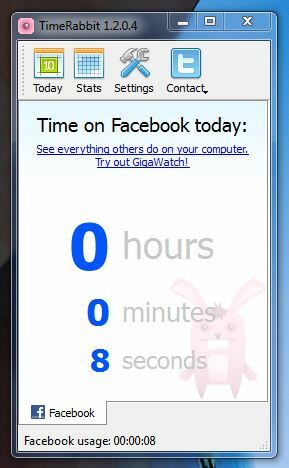 TimeRabbit is a Windows application that will monitor the time spent on Facebook, and tally it up for personal reference. Okay, so it may not be true for everyone but Facebook is one of the most widely used social networks. 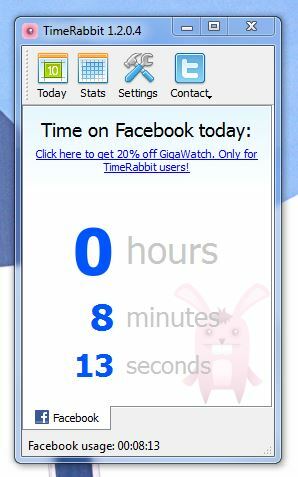 Because of that, TimeRabbit just makes a lot of sense especially when you want an accurate estimate of time spent on Facebook. You can do a lot of things with such information, more importantly it can even help you become more productive throughout your day. It’s a lot easier to comprehend the fact that you’re wasting too much time on Facebook, when you have solid numbers right in front of you. 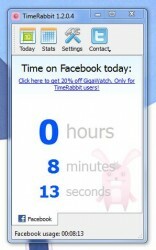 This application tracks the time you spend on Facebook in your browser. That means if you often use the mobile app on a tablet or smartphone, you’re not actually getting the complete picture of time spent on the platform. That’s okay, you can use logical thinking to come to the conclusion that if you’re on Facebook a lot in your browser then you’re on Facebook a lot period- even without the mobile app. Also, CNET now bundles software offered on their website with bloatware. More specifically, if you’re not careful you can get the CNET download manager instead of the application itself. Make sure to pay attention when interacting on the download page, and choose “direct download link” at the very bottom of the list (just above the bottom banner). If you’re not exactly sure what I mean, refer to the image on the right. That being said, you already know by now that TimeRabbit requires an install before it can be used. Unfortunately, there is no portable version available which is something I’d like to see happen in the future. Provided you don’t accidentally download the CNET manager I was talking about in the paragraph above, the install package is clean of bloatware. The TimeRabbit interface is very minimal, but that’s to be expected since the app isn’t really designed to do that much. The idea here is to record your Facebook usage stats, so that you can take that information and translate it as necessary. The bottom of the window shows Facebook in a tab, which leads me to believe that the app may support additional social platforms in the future. That would be ideal, as you could track social use across many different platforms. Many of us are active on more social networks than just Facebook, after all. At the top of the window are four dialogue buttons: today, stats, settings and contact. The contact button offers direct links to the developers Twitter and Facebook profiles. 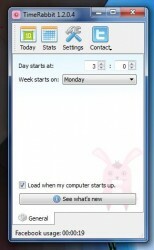 The today button will display the same results that appear by default, daily usage data. The stats button will display total usage stats, separated into daily, weekly and monthly increments. The settings button takes you directly to the app settings menu, which only includes a couple options. 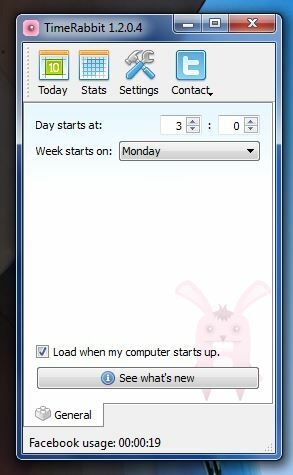 Through the settings, you can change what time the day starts (in hours and minutes), what day the week starts on, and tell the app to load during Windows logon. If you close the interface, the application will minimize to the system tray. You can call upon it again or close it by right clicking on the icon. According to the developers the application works with Chrome, Firefox, and Internet Explorer (except for IE10). However, I found that the app did not work properly when I was using Chrome (version 29.0.1547.62m). I restarted both Chrome and the application with no luck. However, when I launched Internet Explorer and opened Facebook, the app immediately began monitoring my time on the website. I’m not sure if other users will experience the same problem or not, you can definitely give it a try and find out. Since Chrome is my browser of choice, that’s a pretty big issue in my book. If you don’t use Chrome, then it won’t matter. 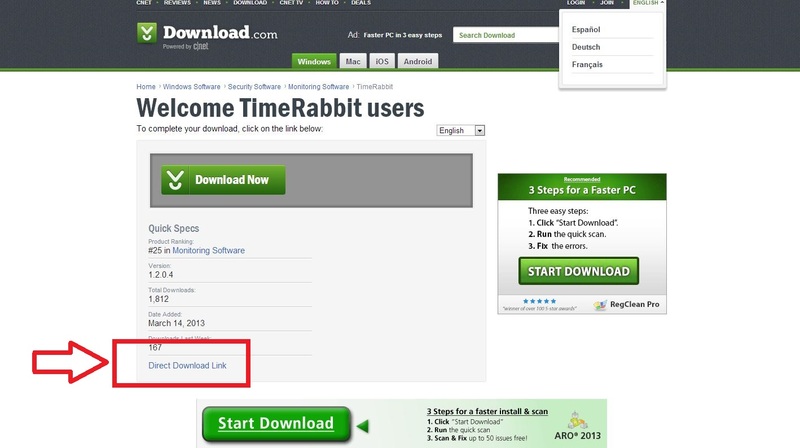 I’m happy to report that TimeRabbit works just fine with Firefox and Internet Explorer. I also found that it works just fine with Internet Explorer 10 in Windows 7 despite warnings. For reference, I was using version 10.0.9200.16660 which is out of date because I rarely use IE. Still, it’s definitely Internet Explorer 10 so I’m not entirely sure why the developers say there’s no support for it. 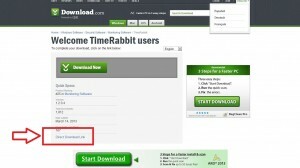 TimeRabbit uses about 22MB of RAM while in use. 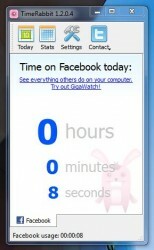 TimeRabbit is an incredibly simple application for Windows that tracks the time you spend on Facebook. It organizes that data provides it to you in a way that is meaningful to you. Plus, you can see daily, weekly and monthly stats all in a single interface. What you do with that information is entirely up to you. Hopefully, you’ll use it to manage your time much more efficiently thus leading to higher productivity ratings. Unfortunately, I did come across some issues during my time with the app. Despite what the developers claim it did not work with Google Chrome, but did actually work with Internet Explorer 10 (they said it wouldn’t). I’m not entirely sure why this is, or if it will be fixed anytime soon but it’s definitely worth noting. 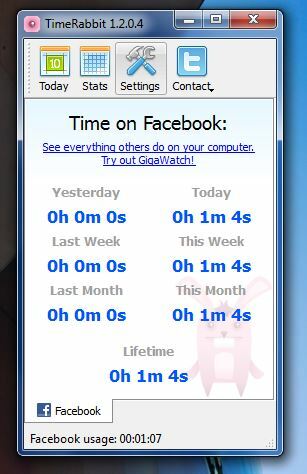 Overall, if you’re looking for a simple way to track time spent on Facebook, you might want to check this one out.